You're hosting a small party at 9:00pm. It's 8:49pm and you're not prepared. Quickly drive to pick up your friends who cannot drive, shop for necessities and calm your friends down when they message you. You don't have time to lose. Gatho at 9:00, was made for a university assignment where we had to create a game based of a real life experience. I chose the feeling of being unprepared and rushing to get stuff sorted for a party. Although not directly a reflection of the real life experience, the game emphasises the feelings you have in a short, exciting experience. There are various different "tasks" or "scenes" in the game, which the player has to accomplish in order to move onto the next one. I wanted each of them to have a different mechanic, to create the sense of disorder and increase the pressure on the player. Each of these scenes encourages pressure and anxiety for the player in different ways. The Driving scene, has the player thinking fast, finding the right letter on the keyboard to finish as fast as possible. The Friends House scene, has the player spamming the space-bar, hopefully increasing their heartbeat slightly and encouraging motor-functions which can be seen in the real world equivalent as in-patience. The Messaging scene, has the player spamming any key on the keyboard to reply to their friend. This implies the sense of urgency and drills home the fact that failing to finish the game will disappoint the player's friends. Finally, the Shop scene, has the player hastily looking for produce in a small shop. This can encourage anxiety, in-turn; having the player perhaps making bad decisions or missing obvious items. Music. This was done by finding a fast paced track on Incompetech (Darkling) and then adding a ticking clock every 1 second. Not only does the music encourage fast behaviour, but the ticking implies that there's no time to lose. Popping Text. Each scene in the game has coloured text which pops in and out. They provide information and context to the scene, as well as encouraging the player on how to act. War is approaching and nearby Kingdoms are coming to you for assistance. Some of them truly want to be on your side, yet others are trying to deceive you. Pay careful attention to what they say and their Kingdom's statistics to determine whether or not they are telling the truth. For this game jam, we were given 3 words that the game needed to involve. Kind, thwart and blip. The idea of being kind or thwarting someone made me think of Papers, Please. So I went with a medieval variation of that game. Having a timer. It's in the middle of the screen, so it's always in their view. 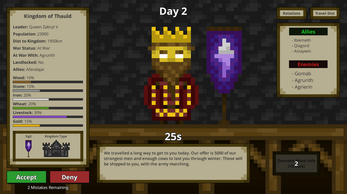 Allowing the player to know how long they have left until failing, causes them to feel more pressured. Keep Talking and Nobody Explodes, has the players on edge and feeling pressured the entire time. With a ticking timer as well, this does indeed cause the players to hurry and feel more on edge as the game progresses. Adding in more sections that the player needs to check is another way to make them feel pressured. All of a sudden they need to review Kingdom relations and travel distances. Still within the 30 second time limit, their pace of reviewing information increases as more is introduced, increasing the pressure on the player. This can be seen in Papers, Please, where new requirements are added constantly. This is a remake of an old 1982 Atari game, Barnstorming, in the style of the famous American painter, Edward Hopper. You play as a car, driving out from the large city to your new country home. Avoid obstacles, while going through gas stations to get to your destination. From early playtests, it was obvious that people did not know that they had to go through the gas stations to win the game. So to communicate this mechanic without directly telling them, a gas station was placed directly in-front of the player at the start of the game. This caused them to almost always go through it. Re-creating Edward Hopper's realistic art style was something I struggled to figure out early on. Eventually though, I went with a low poly approach, theming it to the 1930's. This was done by making the textures less saturated and having an old-timely font. Overall, I believe that even though it doesn't feature realistic painted visuals, it still relates quite a bit to Edward Hopper. The main correlations to the artist though, was done through the setting. All things Edward Hopper painted like trains, looking out of windows, countrysides, gas stations, etc, were implemented into the game. A main aspect of his paintings was looking out of windows, which the camera appears to do in-game. Lighting was another element Hopper fondly painted. In the game there are 3 levels, each with a different level of lighting and visual style. Dusk, Dawn and Midnight. This creates both a different visual style, as well as altering the game. At Dawn, there are more potholes and at Midnight, vision is limited. These small differences create distinguishable levels, for a project we only had a few weeks on.